What does the word "barbecue" call up for you? That rich red sauce smothering thick cuts of meat? The robust smell of smoldering mesquite chips? Or the melt-in-your-mouth quality of meat that's been slow-cooked for hours? America has many fiercely defended regional traditions of barbecue. Here are eight of the most popular styles. #(clear n1). [%image takingtemperature float='clear right' width=400 caption="It's all about the pork in North Carolina. "]North Carolina. In the Carolinas, it’s all about pork — and using the whole hog, not just the choicest cuts. Pulled, shredded, chopped, and sliced, pork is served alone, with a vinegary sauce, or on a bun or white bread with a coleslaw consisting of chopped cabbage, mayo, vinegar, and pepper, and more of that thin, tart vinegar sauce. #(clear n2). South Carolina. South Carolina's claim to barbecue fame is its unique barbecue sauce, dubbed "Carolina Gold" for its mustard base. German immigrants often get the credit for the mustardy sauce, which usually includes vinegar and brown sugar and sometimes has a kick, too. #(clear n3). Texas. Texas barbecue emphasizes beef; different cuts, especially brisket, are smoked over a variety of charcoals or wood chips for hours. This open-pit style of cooking gives many areas of the state an intoxicating aroma. Often the resulting meat is served dry, without sauce; some Texans feel quite strongly that smothering meat in sauce takes away from the natural, robust flavors of the meat and the smoke. But when there is sauce, it's generally a tomato-based style. And since the state borders Mexico, you’ll find influences from that country’s cuisine throughout the southern part of the state, including using sheep or goat meat instead of beef. #(clear n4). 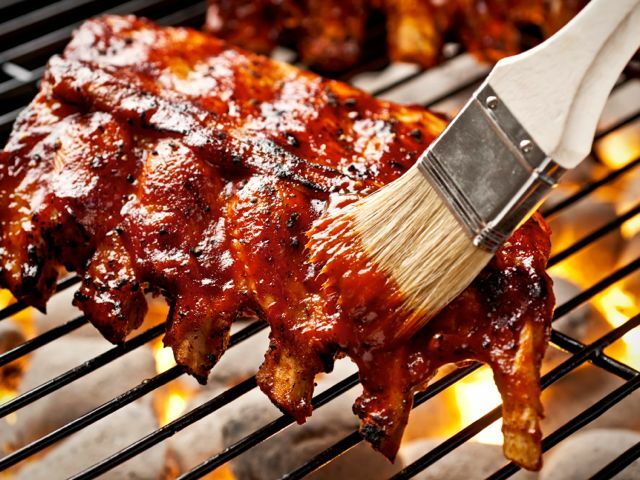 [%image reference-image float='clear right' width=400 caption="Ribs are the star of the show in Memphis."]Memphis. Possibly since Memphis is positioned between the Carolinas and Texas, the city's barbecue style is a blend, serving both pork and beef. The star of the show here is ribs. You can order your ribs wet (smothered in barbecue sauce) or dry (no sauce). A dry rub is generously applied to the meat before it’s smoked, and the rub can consist of intense flavors: paprika, cayenne, chile powder, black pepper, white pepper, onion powder, garlic powder, salt, brown sugar, and oregano, among others. #(clear n5). Virginia. Both the Carolinas and Memphis have influenced the Virginia barbecue style. Among the other meats being served, you’ll find the famous Virginia ham — including Smithfield ham, which is only produced in Smithfield. Beef and pork take a back seat here, while chicken, venison, and even squirrel take their turn on the grill. Bourbon is a popular addition, turning up in sauce as well as with vinegar and red-pepper flakes. A sweeter, tomato-based sauce is served in the western part of the state. #(clear n6). Kansas City. Kansas City is known more for its sauce than for its choice of meats or cooking techniques. Unlike any other region, Kansas City uses a sweet sauce. It’s known for being ultra-thick and tangy, often containing a tomato base with molasses. The sauce goes over everything, including one of the most popular barbecue dishes in Kansas City: the burnt ends, which are literally the slightly burnt crispy ends of the meat. #(clear n7). California. California cuisine has an image of light, vegetable-laden, super-healthy dishes, but the state also has a barbecue style all its own. Spanish and Mexican influences are clear in Santa Maria-style barbecue, a cooking tradition born on California’s central coast in Santa Barbara County. Grilled tri-tip beef rump and top sirloin steak are heavily seasoned with salt, pepper, and garlic, then grilled over hot wood coals and local red oak. The meat is often served with pinquito beans, a bean that grows well in the Santa Maria Valley’s mild climate. #(clear n8). Hawaii. The most iconic image of this tropical paradise is barbecue. A pig, usually adorned with an apple in its mouth, is roasted on an open fire during the Polynesian luau. 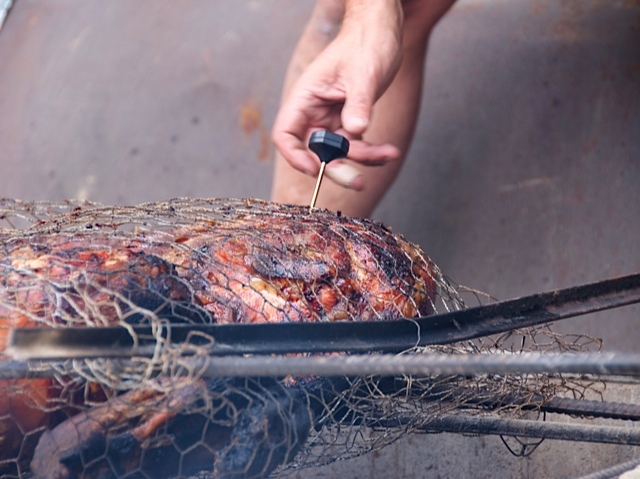 Pit barbecue, where the meat is buried in the ground, can also be found throughout the island. This method was brought by Korean immigrants and consists of beef, pork, or goat cooked in a pit lined with banana leaves.